This is a little something I wrote for Verge, the newsletter of MJTI. You can see a little of Verge at vergenewsletter.com, which, by the way, will become a full online magazine in the next few weeks. We have columns by our faculty and our Israel coordinator. I write a few articles every month as well. And the topics in Verge are right up the center of what Messianic Jewish Musings readers care about. Anyway, in this article, I discuss a connection I really did not know existed. What do hamentaschen and matzos have in common? What accord could there be between Pharaoh and Haman, Moses and Mordecai, Miriam and Esther? Actually, it is a pattern in the Jewish calendar that there should be a thirty-day period of preparation before a major observance. The High Holidays have the month of Ellul before them with preparations and soundings of the shofar. Passover also has its preparatory season, with the Fast of Esther and Purim to set the tone for a spring of commemoration and celebration. But there is more. The main part of the story in Esther took place on Passover. Haman cast the infamous lot to set a date for the destruction of the Jews on the 13th of Nisan (Esther 3:7, 12). The third day, when Esther went in to see the king, would have been Nisan 15. Thus, the Jews of Susa fasted through Passover in that year! Both Passover and Purim occurred outside the land, in Egypt and Persia. Both involved the near extermination of the people of Israel. Moses and Esther both appeared before kings to rescue their people. Pharaoh’s army and Haman both perished. Let us tell the stories and make merry the occasions of this year 5770, remembering that God, who has been working toward final redemption through the millennia, has brought us closer still. The centuries have raised up Pharaohs and Hamans and worse, yet the people of Abraham’s promise remain. As surely as Purim and Passover are connected, so all things in history are moving toward the day of Messiah. 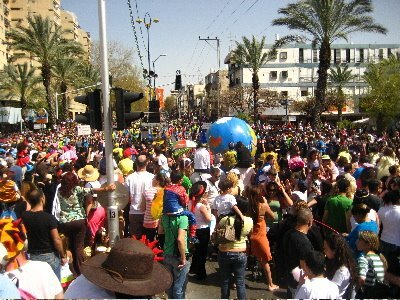 Purim begins at sundown Saturday night and the main festivities are on Sunday. This entry was posted in Holidays, Judaism, messianic, Messianic Jewish, Messianic Judaism and tagged Passover, Purim. Bookmark the permalink. There are even more similarities. Esther rose up on Nisan 16 in the presence of the King to intercede on behalf of her people against a law that could not be changed. Jesus also raised up on Nisan 16 to intercede on behalf of her people against a law that could not be changed (10 Commandments). Both could only do so because they were fully members of both sides. Esther was both Jew and Royal. Jesus – both man and God.